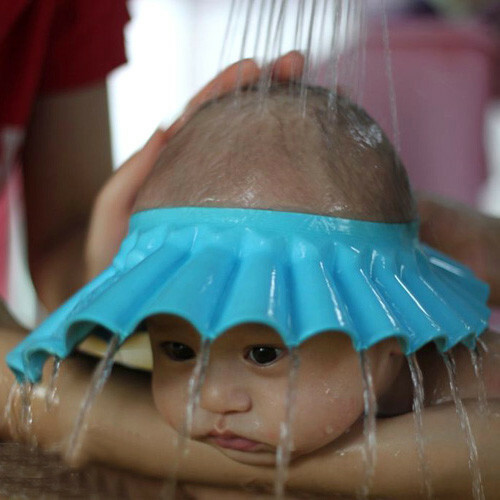 Baby hair washing shield that protects your babies eyes from soap and water as you wash there hair. Why don’t all of us have one of these already? They make bath time so much easier as when you pour water over your babies head it does not drip into their eyes. Protects your babies eyes from shampoo, making showering your young one so much easier. Fully adjustable so it can change to match your baby’s head size, with little clip buttons at the back typical of children’s wear. Heat resistant material is perfectly safe for your baby. This item really does make bath time easier and showers even more so. Shampoo in the eyes is an issue for many households and it can make shower time a real pain for parents just trying to keep their children clean. This item does solve the issue quite well and the adjustable size means that it can fit just right so water does not drip beneath. Getting it on properly can in some cases be a bit tricky. Some models of this cap did not work so well because they tried to use a one-size-fits-all approach to sizing which resulted in some loose fits and as a result water running beneath them. A simple yet very useful item to keep water and shampoo out of your baby’s eyes, making bath time so much easier.